The pension system in Switzerland has three general components: a first pension pillar (basic state old-age and survivors' insurance scheme), mandatory second pillar occupational pensions and private (voluntary) pensions (third pillar). The compulsory second pillar system means Switzerland is one of the few countries where the three pillars contribute almost equally to old-age income. The old-age and survivor pension insurance (AHV – Alters- und Hinterlassenenversicherung) is the first pillar of the Swiss social insurance network and aims to cover the basic needs of retirees. The national (federal) public pillar was introduced in 1948 and absorbed pre-existing cantonal systems (some of which date back to 1904). Disability pensions were offered in 1960. The AHV is obligatory and mainly pay-as-you-go financed. Since 1999, the AHV has also been partly subsidised through VAT revenues. 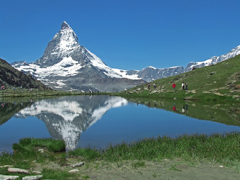 The plan covers all persons domiciled in Switzerland, as well as those in gainful employment. A person is eligible for an AHV pension as soon as contributions have been paid for one full year. Men are eligible from the age of 65 and women from the age of 64. The exact benefits depend upon the years of contribution and the relative average income during the insurance period. A full pension is paid if the person has paid into the scheme for the same number of years as others born in the same year. If the person has not contributed into the plan for the full period, a proportional pension can be drawn. A pension may be received before reaching official retirement age, but the pension paid is adjusted accordingly (by between 3.4% and 6.8% for each year the pension is drawn early) A pension can be drawn later than the retirement age by one to five years. The amount paid increases by between 5.2% and 31.5% depending on the number of months that payment is deferred. The second component of the Swiss pension system (Berufliche Vorsorge/BV(G) – Prevoyance Professionelle/PP) is workplace-based and mandatory. Employees whose annual earnings exceed CHF 19,350 with the same employer are mandated to join the compulsory pension system under the Occupation Benefits Act (LPP), although it is voluntary for the self-employed and those who do not qualify in terms of earnings. The system stipulates a minimum level of benefits to be provided by all employers, but the mixture of compulsory/voluntary features of the system can be seen in the fact that many large employers offer benefits that go well beyond the prescribed minimum. Depending on the insured's age, the contribution rate varies between 7% and 18% for earnings between CHF 22,575 and CHF 77,400. The total contributions increase with age. The insurance scheme can be run by a company pension, state or private fund. Employee contributions must at least match those of the employee. Company pension plans can set terms and conditions in excess of these minimums, and most offer super-obligatory benefits as a means of attracting and retaining qualified people in a labour market that has experienced a persistent shortage of skilled staff. Both employee and regular employer contributions are tax deductible. Special employer contributions above the normal annual contribution are also tax deductible. The extent to which such additional contributions are possible depends on the actual circumstances, with five times the regular contribution as a reference figure. Employees who join a pension plan without or with only very small benefits accrued during their previous employment are allowed to pay additional contributions to make up for that gap in past coverage. The foundation itself is a tax-exempt organisation and it does not pay tax on its investment income. Employer contributions are not treated as taxable income to the employee. Benefits are taxed as normal income and lump sum benefits are taxed at reduced rates. Benefits are normally paid in the form of an annuity. It is possible to draw a pension before reaching retirement age if the regulations of the pension fund allow. Death and disability benefits are also provided. Immediate full vesting and portability is required and indexing, although not legally required, is widespread. The compulsory occupational scheme requires certain minimum pension benefits based on a guaranteed interest rate of 2.75%. In line with this approach, additional voluntary defined contribution (DC) plans nearly always define a target interest rate.